68 Kill is a genre bending film that mirrors the early grindhouse work of Tarantino. A sleazy, gore infused heist film that turns a simple premise on its head with tantalizing twists. The film doesn’t bring anything new to the table but thanks to a trio of superb performances, it’s able to provide some screwball entertainment. The self-seriousness of the story is what makes the film standout. Matthew Gray Gubler plays Chip, the whipped boyfriend of Liza who partakes in a night heist which goes terribly wrong. The night is full of crazy events that are being seen through the eyes of Chip. He’s not a bad person but when pushed to the brink he must do whatever it takes to survive, even if that means pulling a trigger. Gubler’s everyday man persona works well here as he horrifically witnesses his girlfriend of six months murder a husband and wife. At 95 minutes the film moves at a steady pace and Chip is never able to process what the heck is going on. Knowing he’s in too deep, he doesn’t think before he acts, resulting in even more chaos. AnnaLynne McCord plays Liza, the blonde bombshell girlfriend who is willing to risk it all to get $68,000 from her ’employer’. She uses her looks to manipulate everyone, even the boyfriend that knows she’s out of his league. Though Gubler is the anchor of the story its McCord that really shines as the conniving criminal. Alisha Boe from Thirteen Reasons Why also does great work as Violet, a young woman who witnesses the murder before being kidnapped by Liza and Chip. For her time in the film, she adds humility to a rather twisted tale. The scenes between Violet and Chip are sincere and result in Chip turning over a new leaf as he learns not to take crap from anyone. 68 Kill is a wild ride from start to finish, with a quirky Coen-esque script, told through the eyes of Tarantino. These films are a dime a dozen nowadays but what makes this one standout are the characters of Chip, Liza, and Violet. The stakes that are established help to make these characters resonate more with the viewers. The despicable Liza is so damn entertaining to watch, even if she’s plotting something dangerous. Violet is a down to earth woman that fell on hard times, she provokes a vulnerability from Chip that we don’t see early on. Chip is a pushover boyfriend that gets himself caught in a web of crime, however, because he’s such a likeable loser we root for him to escape with the 68K while riding off into the sunset. 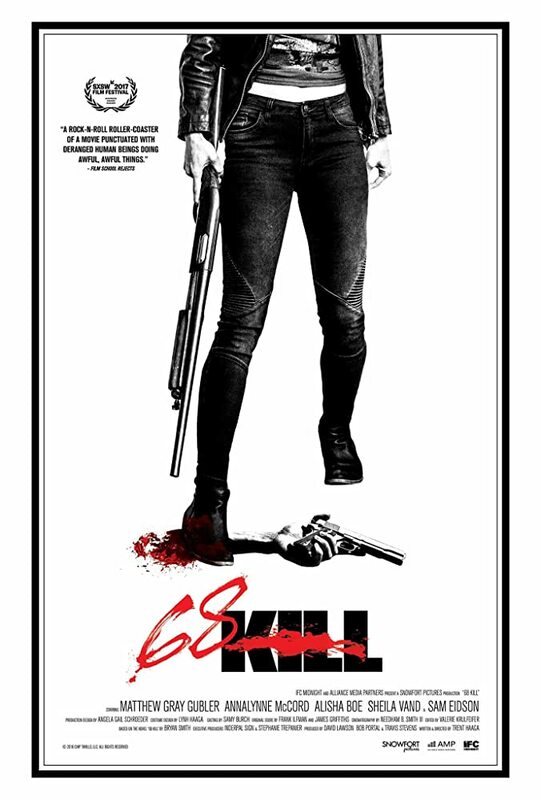 It’s hard not to see 68 Kill earning some kind of cult status down the road as this is a film that deserves a midnight screening at the local art house theater.